Last Year, I wrote an article for the "Ash Breeze", the quarterly journal published by the TSCA (Traditional Small Craft Assoc.) desrcribing the start of my MDE boatbuilding project. 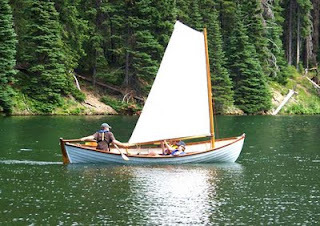 I got a nice email from Steven Clancy who built the same boat 20 years ago out in Bellingham Washington. Steven sent along some nice photos, and I'd like to share them here! 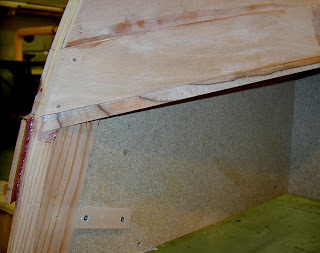 Steven built his hull from 6mm occume and framed her up with laminated, sawn frames, instead of steamed ribs. This will be my plan as well (the frames, that is). His thwarts and stern sheets are cherry. Steven did a beautiful job with his peapod, and Matty, as she is called, now belongs to his daughter Brenna, and son in law Ben. Its time for me to get to work! Can't wait. It has been quite a while since the last post. 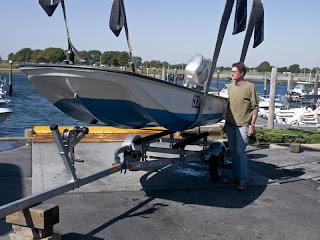 I should have been planked up, flipped over, and well into the interior by now, but I have been very busy elsewhere for the past six months with work and sailing, not to mention the time spent re-powering the Sebago Canoe Club Boston Whaler; all good things though, and all necessary. 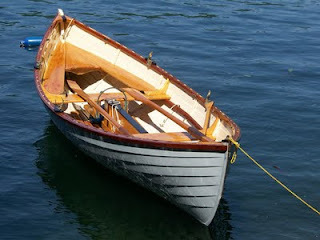 Sebago acquired a classic 13 foot Whaler to serve as a new safety boat/club launch. 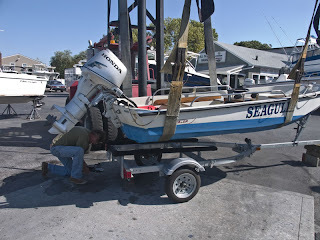 I had the job of selecting a new motor for the boat, and having it installed. We hung a beautiful new Honda 30, with power tilt and trim, on the transom. "Seagull" has already served race committee duty this fall. In the last post, I had the garboard planks hung. They were difficult, ornery things to twist into place and fasten, but as they are typically the most difficult of the seven pairs of planks to hang, things have gotten easier as I planked around the bilge and up the topsides. 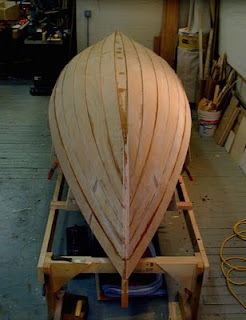 The garboards, (and each subsequent plank as well in their turn), must be beveled at the laps so that the next plank has a place to land, and will lie flat to the next mark on the mold. 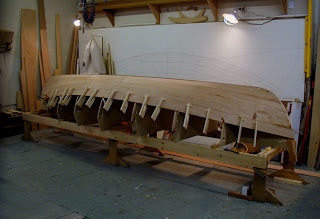 Lapstrake planks are like facets cut into the round shape of the boat, and each plank overlaps the one below it by a set amount (3/4” in this case). The bevels are cut with a block plane, and checked frequently with a straight edge against the mold. Checking the bevel with a straight edge. Also, gains must be cut into the hood ends of each plank so that the edge of the next plank disappears, or lies flush with the one below. I like to use rabbeted gains, possible only with glued laps in plywood. Solid wood planking would have to be treated differently, because the wood would split along the weakened rabbet line. Rabbeted gain at the stem. 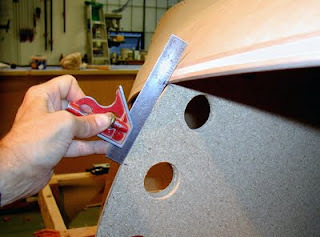 To find the shape of the next plank, a pattern board, or spiling board is bent around the molds, making sure to overlap the bevel planed onto the previous plank. Care must be taken not to edge set the pattern board. It must lie perfectly flat at each mold, or the plank shape will be off when the pattern springs back. Any attempt to force an untrue plank edgewise will create a bunch or wrinkle in the plank, and no amount of coaxing will lay it flat. 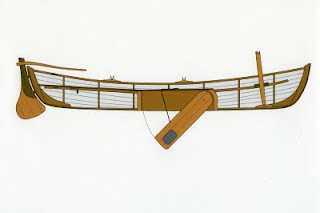 The pattern is marked from underneath at each mold, and along the upper edge of the plank above, then removed, laid on the planking stock, and all of the information transferred. I like to play it safe, cutting outside of the lines by 1/4" or so and putting the actual plank on the boat for final marking. I use a single, washer-head screw through the lap at each mold. this guarantees that the plank will go back on the boat in the same place when the glue is on. I then take the plank off again, cut the scarf, snad the inside, and mask off below the lap lines with tape to keep the epoxy drips at bay. I use simple clothespin type lap clamps to squeeze the laps together between molds. 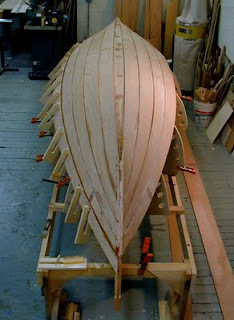 The planks twin is then hung on the other side of the boat, then another plank is patterned and gotten out. There develops a rhythm; bevel the lands, cut the gains, pattern the plank, cut it out and glue it on. One thing that I noticed, at about plank four, was that I was getting a little unfairness in the region of the scarf, due to fairing only one half Of the plank (either forward or aft) at a time. 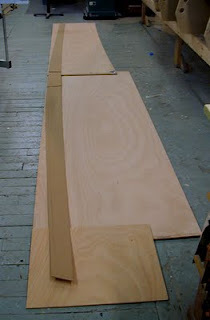 I decided that I would be better off scarfing up long lengths of ply, then laying out the entire plank at once. 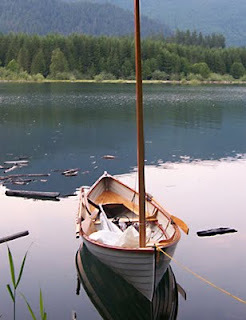 By doing that, I was able to fair out a small hump in the run of plank five, letting my batten sweep the entire length of the boat. Plank five is what transitions the turn of the bilge to the topsides, and is the straightest plank in the boat. I also decided to hot-glue up long lengths of cardboard to use as patterns. By plank five, most of the twist is gone from the shape, and the cardboard lays nicely on the molds, being simply push-pinned on and marked out. The pattern for plank six is laid out on the planking stock. I've just finished hanging plank six at this point, leaving only the sheer plank to go. I will still need to fit the outside keel and stems before I flip her over. I'm really hoping to see her right side up by Christmas! One more plank to go!